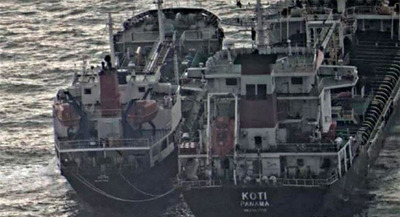 A Chinese broker arranged the illicit supply of oil to North Korea via a tanker called the Lighthouse Winmore, the Taiwanese national charged with renting it has told prosecutors according to the local press on Thursday. The Lighthouse Winmore has been seized by South Korean authorities and sits in Yeosu port. Prosecutors in Taiwan's Kaohsiung Province said Tuesday that Chen Shih-hsien (52) was questioned on charges of using the Lighthouse Winmore to illicitly supply oil to North Korean ships. The Liberty Times of Taiwan said Chen told prosecutors that a "Chinese middleman" arranged the point of delivery and coordinated the ships involved. Chen denied knowing that the oil was being sent to North Korea. He has also been charged with providing false information to Taiwanese customs about the cargo and its destination. The Lighthouse Winmore was captured on camera pumping the oil into a North Korean ship called the Samjong No. 2 on the high seas after loading up on it in Yeosu. The U.S. last month wanted the Lighthouse Winmore to be blacklisted under UN Security Council sanctions, but China opposed the move.